On the 13th Firefly Sightseeing Evening this year, surrounded by dark black night, the fireflies will accompany your walk with dream-like view. The festival are held every year in early June or the start of summer in Japan. You can see the dancing firefly at Izu Ōkawa from 5th until 15th June 2015. 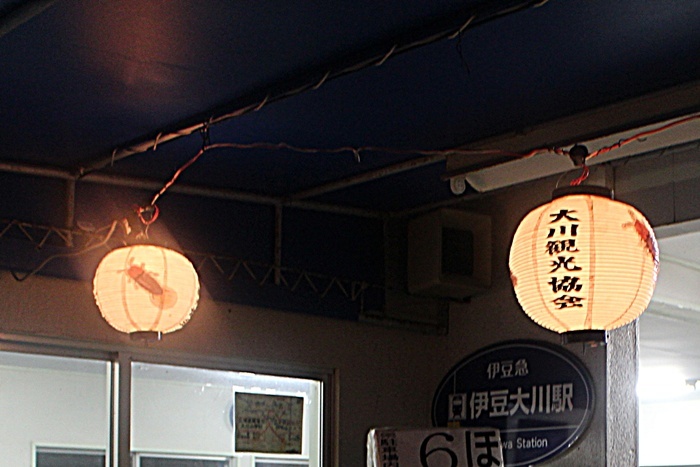 The moment you get off from the train and get out the station, there will be lanterns hanging along the street. There aren’t too bright lamp, and it feels as if this village are really welcoming you to enjoy the natural light of firefly. In front of the station there was a bus waiting to pick you up to the firefly sightseeing place. When the bus is full, it will depart, so no time schedule for the shuttle bus. 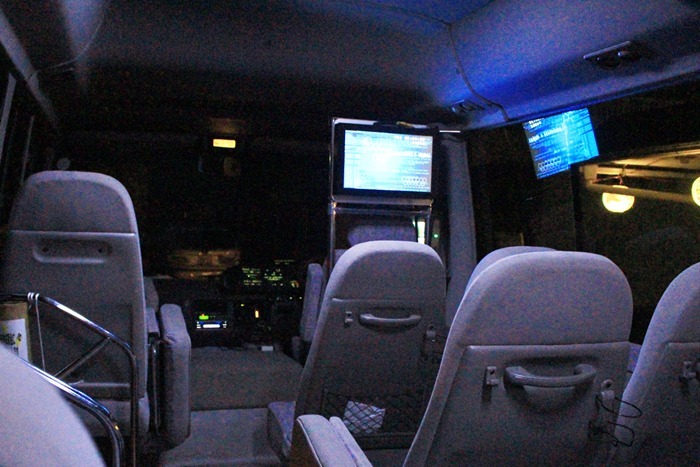 Shuttle bus will be operating from 19:10 until 20:20. The bus is free but please contribute 200 JPY for the fireflies maintenance at the little wooden container at the bus door. 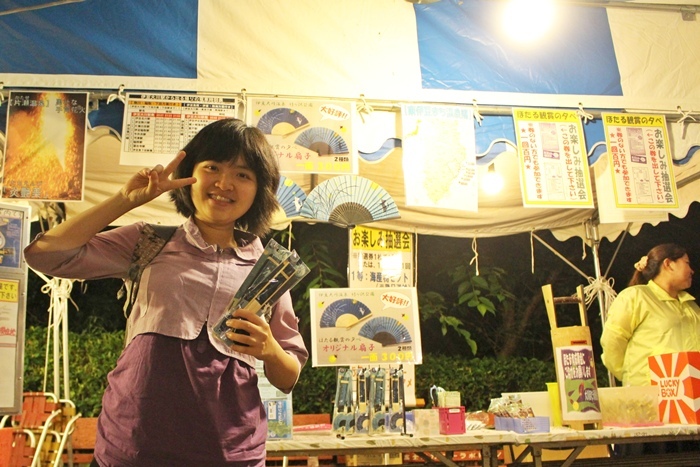 While the trip to the firefly festival place, there will be a short explanation about Ōkawa fireflies. There are 19 types of fireflies in Japan, and the firefly type in Ōkawa is called Genji-botaru (Luciola cruciata). When you arrived at Takegasawa Park, the staff will greet you and you are guided to the path. Walk a little and you will arrived at a small pond. Over there, the water sound are very calming. Also, when the fireflies fly across the pond and the water reflect their light, it was very beautiful. I am sorry I can’t provide any fireflies picture. They are so small that my camera can’t capture their light. 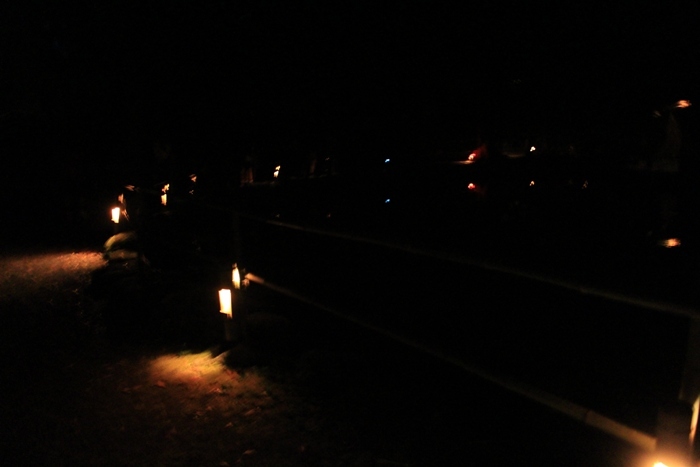 The best I can provide right now is the pathway with small lamp forming a row and the lantern pictures. At the end of your walk, you will be welcomed by the friendly staff. 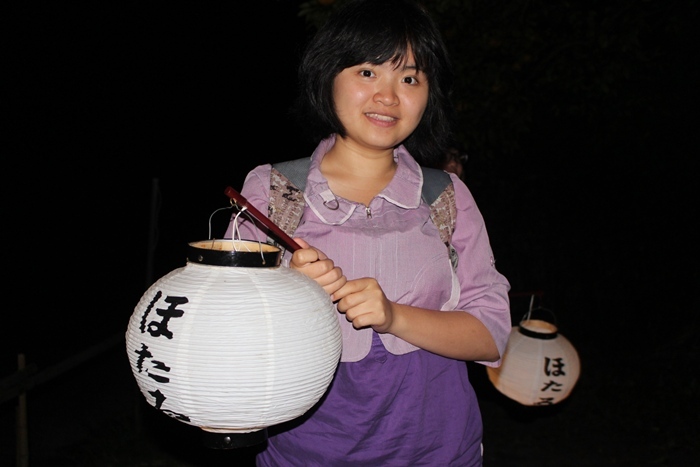 Give back the lantern and you can buy some snacks from the stall. 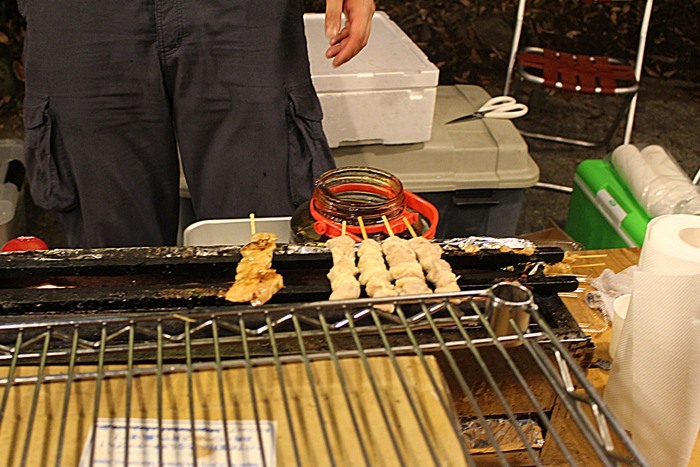 I bought yakitori (grilled chicken on the skewer) because I felt it suit the mood. 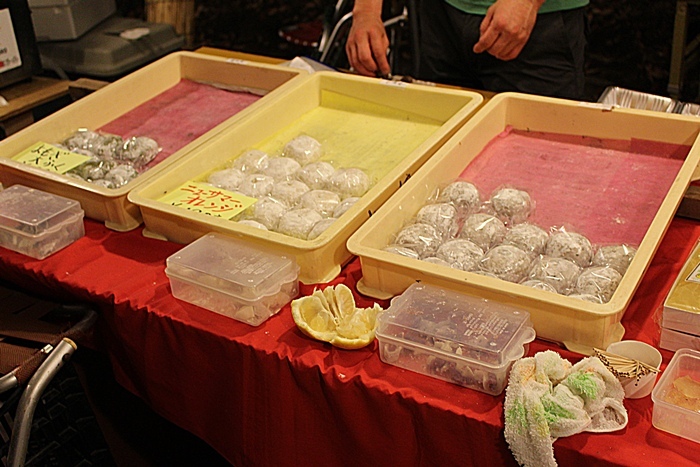 There were also other foods like yaki-soba (fried noodles) and takoyaki (octopus dumplings). I also tried a mochi cake and bought some for my friends. 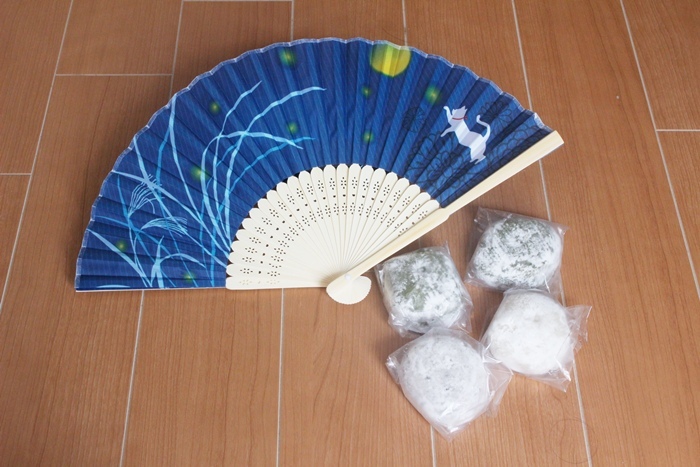 They sold pretty fan with fireflies and Japanese pampas grass (Mischantus sinensis) pattern! I like the pattern very much because every time I look at it, it reminds me of the serene night I saw over there. I wish I could set up a tent over there and sleep surrounded by the soft light of fireflies… But I need to go back. 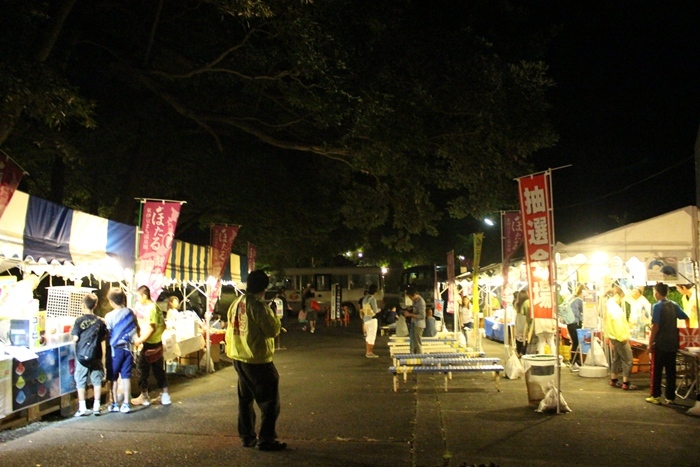 The festival ended around 9 p.m., everyone start cleaning up and we go back to the station by shuttle bus. Thank you for reading this article. Hope you can join us in the Firefly Sightseeing Evening next year!